Assam separatist movements are insurgency movements operating in India's oil-rich state of Assam. The conflict started in the 1970s following tension between the local Assamese and the Indian government over alleged neglect and internal colonisation through its federal centre in Delhi. The conflict has resulted in the deaths of 12,000 United Liberation Front of Assam (ULFA) members and 18,000 others. The secessionist goals of the separatist movement in Assam have lacked popular support, with most Assamese sympathizing with the separatist groups but not empathizing with their goals. 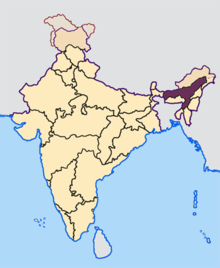 Several organisations contribute to the insurgency including the ULFA, the Adivasi National Liberation Army, Karbi Longri N.C. Hills Liberation Front (KLNLF) and the National Democratic Front of Bodoland (NDFB) with ULFA perhaps the largest of these groups, and one of the oldest, having been founded in 1979. The ULFA has attacked Hindi-speaking migrant workers and a movement exists favouring secession from the Republic of India. The alleged neglect and economic exploitation by the Indian state are the main reasons behind the growth of this secessionist movement. The ULFA seeks to establish a sovereign Assam via armed struggle. The Government of India banned the organization in 1990 and classifies it as a terrorist group, while the US State Department lists it under "Other groups of concern". Founded at Rang Ghar, a historic structure dating to the Ahom kingdom on April 7, 1979, the ULFA has been the subject of military operations by the Indian Army since 1990, which have continued into the present. In the past two decades some 30,000 people have died in the clash between the rebels and the government. Though separatist sentiment is considered strong, it is disputed if the secessionist movement continues to enjoy popular support. Conversely, assertions of Assamese nationalism are found in Assamese literature and culture. The neglect and exploitation by the Indian state are common refrains in the Assamese-language media with some reports casting the ULFA leaders as saviors. Internationally acclaimed Assamese novelist Indira Goswami has tried to broker peace for several years between the rebels and the government. In a recent development Hiren Gohain, a public intellectual, has stepped in to expedite the process. ↑ "Five killed in Assam bomb blasts - DAWN.COM". dawn.com. Retrieved 12 April 2014. 1 2 "Bloody Tea". Retrieved 28 November 2016. ↑ Kashyap, Aruni (19 May 2010). "India needs talks for Assam's peace". The Guardian. London. ↑ "Bomb Kills 10 at India Independence Parade". The New York Times. 15 August 2004. p. 15 (section 1). ↑ "The Sentinel". sentinelassam.com. Retrieved 12 April 2014. 1 2 Pike, John. "Assam". Retrieved 28 November 2016. ↑ "United Liberation Front of Asom (ULFA) - Terrorist Group of Assam". Retrieved 28 November 2016. ↑ "Where Have They All Gone? | Assam Portal". Assam.org. Archived from the original on 25 October 2010. Retrieved 2010-11-07. ↑ "The Sentinel". Sentinelassam.com. Retrieved 2010-11-07. ↑ Malakar, Paresh (December 2006). "Assamese identity". Frontline. 23 (24). Retrieved 2009-03-15. ↑ "The Assam conflict: a failure of the press". openDemocracy. 2010-07-29. Retrieved 2010-11-07. ↑ "India needs talks for Assam's peace | Aruni Kashyap | Comment is free | guardian.co.uk". Guardian. 2010-01-19. Retrieved 2010-11-07. ↑ "National : Indira Goswami makes fresh attempt at brokering peace". The Hindu. 2007-06-29. Retrieved 2010-11-07. ↑ "Prince Clasu Award Indira Goswami". Princeclausfund.org. 2007-06-29. Retrieved 2010-11-07. ↑ "Conflict and Peace in India's Northeast: The Role of Civil Society" (PDF). Archived (PDF) from the original on 27 November 2010. Retrieved 2010-11-07. ↑ TI Trade (2010-10-13). "The Assam Tribune Online". Assamtribune.com. Retrieved 2010-11-07. ↑ "Peace interlocutor meets ULFA leaders in Guwahati jail". Sify.com. 2010-10-21. Retrieved 2010-11-07.